Every year, the UFCW Charity Foundation’s scholarship program offers scholarships to UFCW members or their immediate family members who want to further their education and demonstrate a commitment to their communities and UFCW values. Since 1958, the fund has distributed more than $2 million in scholarships. 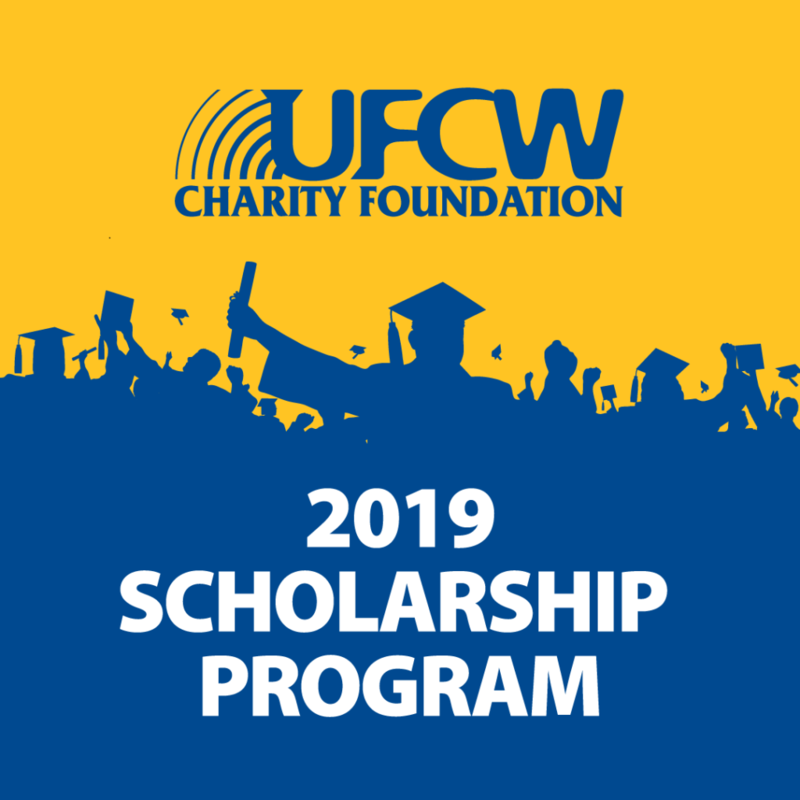 The UFCW Charity Foundation is now accepting scholarship applications for 2019. The deadline for the 2019 scholarship is May 12, 2019. The “Part B” of the application is due by May 26, 2019. Did you know? As a member of Local 400, you and your immediate family members have the chance to receive a $5,000 scholarship. Click here to download the application (PDF) or call Liliana Chang at 703-931-5500. If you, your spouse or child, plan to pursue education or training full-time, we encourage you to apply. Please remember, all applicants must be enrolled for their post-high school education or training by Fall of 2019 to be eligible for this year’s award. MeKel Mock of Manassas, Va. was one of four recipients of the 2017 FELRA Scholarship. Four children of Local 400 members have been awarded Scholarships to help fund their college education in the 2018-2019 school year. The FELRA & UFCW Health and Welfare Scholarship Fund provides $2,500 scholarships to help cover the cost of higher education for Local 400 members who work at Giant, Safeway or Shoppers, and their families. It is funded through the union’s collective bargaining agreements with these employers. Over the years, hundreds of Local 400 members and their children have received a helping hand from their union making it easier to attend college and have new opportunities to realize their dreams. Melanie Alonzo of Springfield, Va.
Ashley King of Chesapeake Beach, Md. MeKel Mock of Manassas, Va.
Justin Smith of Alexandria, Va.
A 2018 graduate of Bishop O’Connell High School in Arlington, Va., Justin is attending Old Dominion University this fall. In high school, Justin played varsity basketball and volunteered as a tutor at his local community recreation center. In college, he plans to major in biology, with an eye toward attending medical school and becoming an anesthesiologist. His father, Ainsworth Smith, works at Giant. “I was shocked,” Justin said of receiving the scholarship, and he is grateful for the help it will provide. In 2018, 115 union members and union family members have been awarded scholarships totaling $150,000, including five UFCW members! UFCW members can start learning Spanish, French, German, English, and/or Mandarin today. To get started, please visit www.ufcw.org/language to fill out an inquiry form. It may take a few days to verify your UFCW membership. However, once confirmed, you will receive an email that explains how to login to and begin taking free foreign language classes. As a member of UFCW, you can use this benefit to learn a foreign language for free online and at your own pace. All lessons are self-guided. Visit ufcw.org/language to get started today! Thank you for being a member of the UFCW union family. We are proud to offer you this free foreign language benefit and we hope you enjoy it. 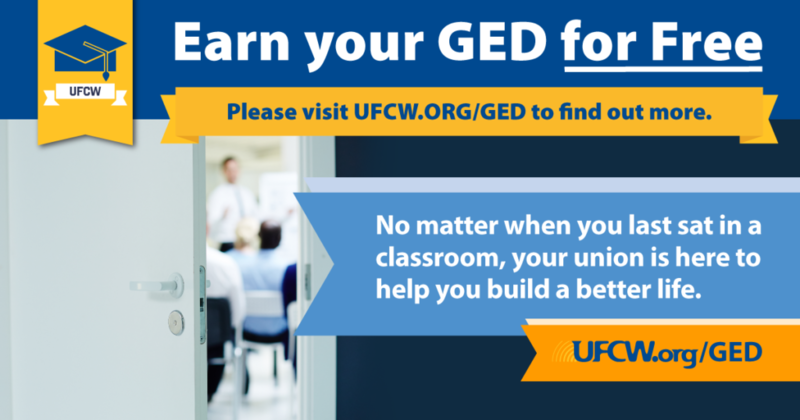 UFCW members can now take General Equivalency Diploma (GED) classes for free through Essential GED. To get started, please visit www.ufcw.org/ged and complete the inquiry form. Once you complete the online form, it may take a few days to verify your UFCW membership. However, once confirmed, you will receive an email that explains how to login to and begin taking free GED classes. 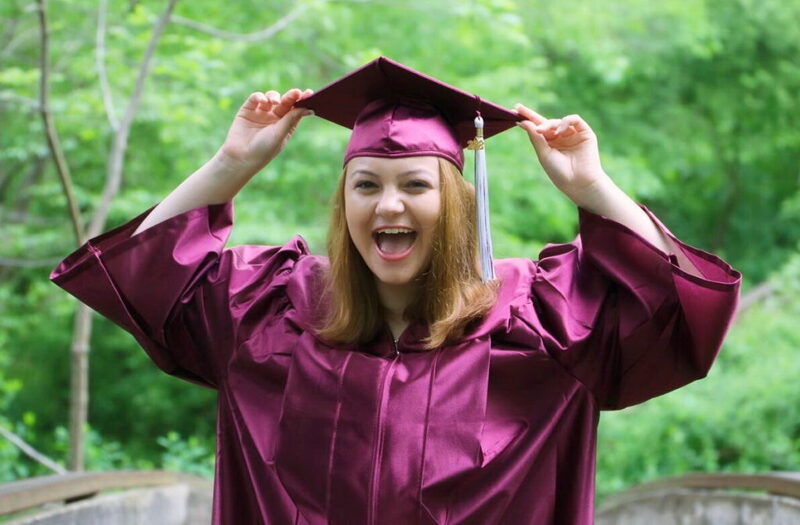 This GED program offers a customized learning plan, so that you will be able to successfully prepare yourself to pass the GED test, regardless of when you last went to school. This program also allows you to study at your own pace—classes are designed to fit your schedule and the program can be completed from your phone or tablet. We created this benefit because our members told us they wanted us to provide more educational opportunities. We hope this program can help you build the better life you have earned and deserve. Thank you for being a member of the UFCW union family. 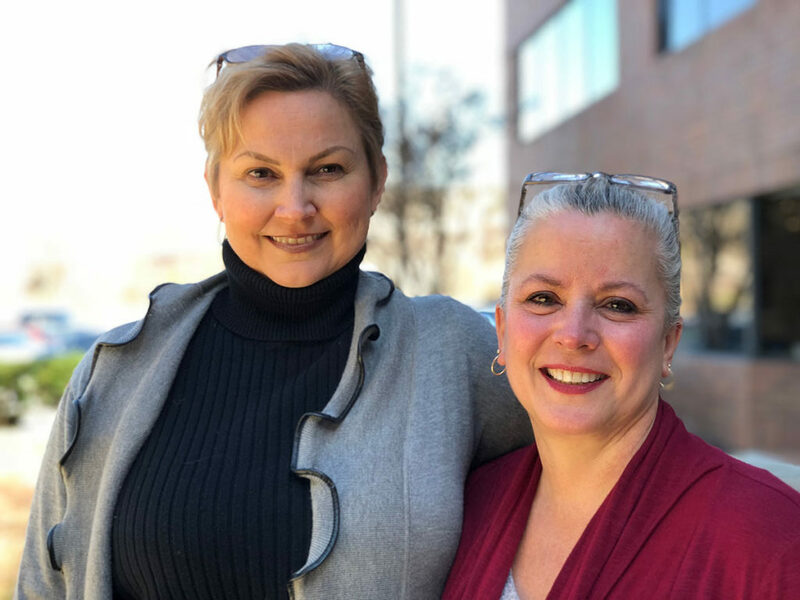 Local 400 shop stewards Lisa Golden (left) and Jennifer Brown (right) are pursuing college degrees at no cost thanks to a grant from the Ben Hudnall Memorial Trust, a union scholarship program available to Local 400 members working at Kaiser Permanente. For most people, by the time your children are in college or beyond, you’re more likely to be thinking about retirement than education. But Kaiser shop stewards Lisa Golden and Jennifer Brown are not most people. Lisa, who has raised three sons, with one still in college, also decided it was time to go back to school—first for a Bachelors of Science in Nursing (BSN) and now for a Master’s in Nursing Education. And neither Jennifer nor Lisa is paying a penny to realize their dreams of higher education and career advancement—thanks to their union. Lisa is no fool. In January, the Hudnall Trust started offering commitment grants for Kaiser union members to get a Master’s Degree in Nursing Education. (Grants for a Master’s in Nursing Administration are also available.) And on April 3rd, armed with her grant, Lisa will start classes. Lisa credits Jennifer, an OB-GYN nurse at Kaiser’s Woodbridge Health Center, with making her aware of this new opportunity. Jennifer started the same program on February 13th. Now nearing the end of her first class, Jennifer said, “Considering I haven’t been in school for a while, the experience has been pretty awesome. I wasn’t sure what to expect, but I will tell you hands down that CTU is doing phenomenal job of guiding me through this. Lisa started at Kaiser in 1999. After providing medical advice for five years, she became a clinical nurse. And for the past nine years, she has served as shop steward. “Early in my career, I learned first-hand what my union could do for me, helping to resolve an issue I faced. Several years later, when I saw others weren’t getting a fair shake, I felt like I should be their voice, to help walk them through the process. “I worked in a non-union environment before I came to Kaiser,” Lisa said. “It stinks. You have no rights and no voice. Coming to Kaiser and finding it’s a union shop, I thought, “Oh my God, there’s power here!’ I feel like we’re on equal ground when we go into a meeting and represent our members. We’re all equal partners. Not only do we get great pay and benefits, but most importantly, we have power in numbers and a seat at the table. Jennifer has been a shop steward for approximately two years, and most of her previous jobs were non-union, too. “Working in other facilities, as nurses, we don’t have much of a voice in what we do and how we do it,” she said. “But I saw how we have a voice at Kaiser, thanks to our union, and being a steward was something I wanted to be part of. Both Lisa and Jennifer strongly encourage Kaiser members to take advantage of the educational opportunities offered by the Hudnall Trust. To find out more, please visit the Trust’s website at www.bhmt.org. For additional information, Virginia and Washington, D.C. members can contact Kaiser career counselor Mary Wiggins, M.Ed. at (510) 381-7033 or Mary.C.Wiggins@kp.org. Maryland members should contact Robin B. Kelly at (240) 298-8026 or Robin.B.Kelly@kp.org.